This guide explains how to set up and and start using theBantam Tools Desktop PCB Milling Machine. It’s a simple process: unpack, insert the collet, install Bantam Tools Desktop Milling Machine Software, and make your first project! A complete getting started guide is included with the milling machine. We can’t wait to see what you’ll make! Open the milling machine box and remove the Accessory Kit, power supply, and cables from the top tray. Remove the top tray and top layer of packing foam from the box. Remove the milling machine from its pink antistatic bag. Remove the three cardboard carriage locks from the rails inside the milling machine. Remove the collet and the two wrenches from the Accessory Kit. Remove the collet nut from the bottom of the tool holder. To do this, use the smaller wrench on the flat part of the tool holder to secure it in place while loosening the nut with the larger wrench. 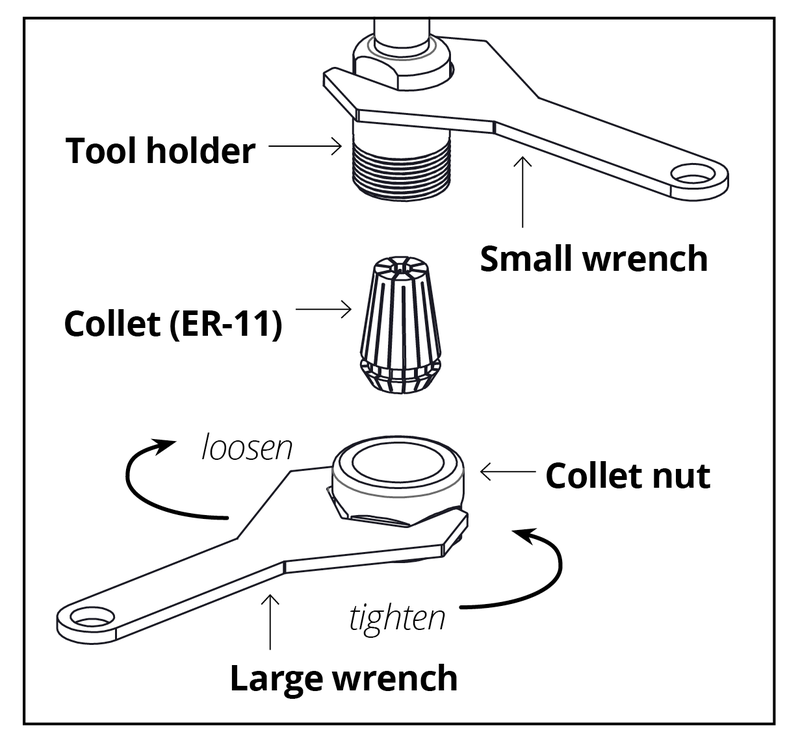 Insert the collet into the collet nut. It might be a little wiggly; putting it on the tool holder will pop it into place. You might also notice the inside of the collet has an offset. This is part of the collet’s design and totally normal. With the collet in place, thread the collet nut back onto the tool holder by hand. Tighten by two or three turns, holding the tool holder in place with the small wrench if necessary. Do not fully tighten the nut without a tool inserted. Place your wrenches on top of the milling machine. There are magnetic pockets on the top of the milling machine to keep the wrenches handy while you’re working. Connect the power supply to the power jack on the back of the milling machine with the built-in cable. Connect the power cable to the power supply and plug it into a grounded electrical outlet. Then plug in the USB cable to the USB jack on the back of the milling machine, and connect the other end to your computer. Important: The power cable has a locking connector. To remove the cable, always pull by the connector. Do not pull by the cable. You’ll need to install our software on your computer to operate the milling machine. Otherplan is available for Windows 7 and above and Mac OS X 10.9 and above. Download it here. Once the download completes, install the program according to your operating system’s instructions. With the safety windows in place, turn on the milling machine by twisting the red Emergency Stop button clockwise and pushing the power button on the back of the machine. The interior lights will turn on and the milling machine will beep. If the firmware on your milling machine needs to be updated, Otherplan will guide you through the process. When prompted, home (calibrate) the milling machine by clicking the Start Homing button. If you’re starting your mill for the first time, Otherplan will also have you locate the spoilboard. The Locate Spoilboard dialog box will automatically pop up and give you prompts to help the machine locate the spoilboard correctly. Now you’re ready to mill! If you’ve used a CNC mill before, feel free to skip to the next section. Whenever you use the milling machine, you will need a design file, milling material, and a milling tool. Design file: The milling machine needs to know what to mill! Once you’ve created a design, import it into Otherplan to scale and orient it the way you want. Our software supports SVG, BRD, Gerbers, and G-Code files. For more information about file types, read the File Support guide. If you’re just getting started, the milling machine comes with three Getting Started Projects. For more information on materials supported by the milling machine, read our Materials Guides. Before you start cutting, you’ll need to attach your material to the milling machine’s machining bed. This is called fixturing. We’ve included a roll of double-sided tape, which works great with flat, thin material like circuit boards, thin metal, or plastic pieces. If the tape isn’t enough, a bead of hot glue around the edges of larger or rougher materials — like wood, plastic, and machining wax — works great. The machining bed is also equipped with tiny T-slots that can be used for fixturing. Milling tool: We’ve included a 1/32″ flat end mill and 1/64″ flat end mill to get you started, but you can use any cutting tool that has a 1/8″ shank. Remember, the smaller the tool, the more fragile it will be and the slower you’ll need to cut. Big tools are great for roughing passes and clearing out lots of material. If you need help selecting an appropriate material, refer to our Materials Guide. Once you’ve imported a design file and loaded a tool and piece of material, you’re ready to mill! Our Getting Started Projects will guide you through using the milling machine for the first time. There are three projects which cover the three most popular methods of using the milling machine. You'll engrave a dog tag using a SVG file, you'll mill a ring using a G-code file made in Fusion 360, and you'll make a PCB badge using a .brd file made in Eagle. All the materials to make these projects come with the milling machine! If you have questions or need help, please don’t hesitate to contact us at support@bantamtools.com! We'd love to hear from you! Happy milling!